The grill worked fine yesterday, when I tested it, but today I couldn’t get the gas flames above a flicker, so I ended up finishing the burgers and dogs in a pan on the range inside. 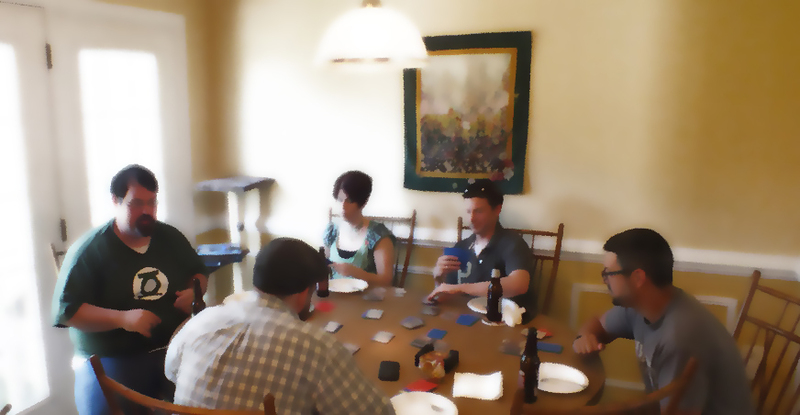 It didn’t seem to matter to the gamers, as they were reluctant to break away from a game of Arcana to eat anything. But eat they did, and after another game ended, many of the company disbanded, leaving myself and the representative from Team Green (everyone picked a color upon arrival and wore a sticker) to play 1775. 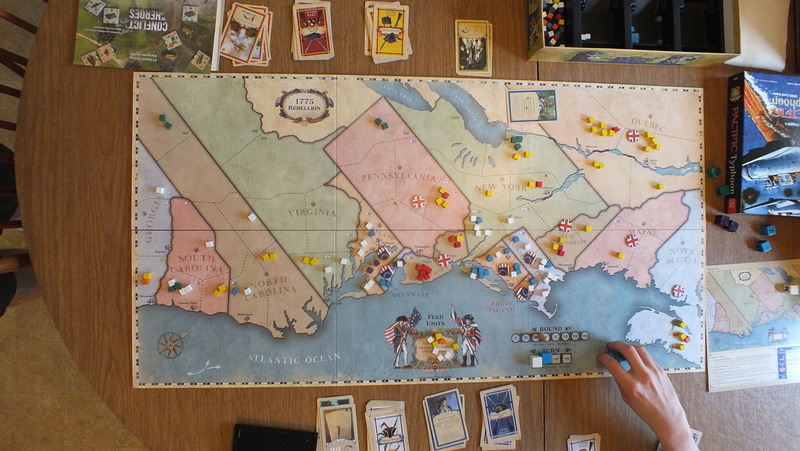 The Rebels began to make some serious gains, capturing and holding Boston and local environs while also consolidating the Carolinas and Maryland. Unfortunately for all, a decisive victory could not be achieved by either side, and all of North America became French. This entry was tagged Gaming. Bookmark the permalink. Have you guys moved on to playing the variants for Arcana, e.g. missions/contracts, B and C cards, etc.? Yes, but with new players we stick with most of the basics. Although most players enjoy building their guilds with both A and B cards, not to mention picking a guildmaster.